The great tapestry (actually, embroidery) of Bayeux resides in France and depicts the story of William the Conqueror during the years of 1064-1066 that culminates in the infamous Battle of Hastings. The picture above isn't the Bayeux tapestry but a modern day handmade inspirational (using the same techniques), made to tell the story of a viking reenactment event Elvegrimarne was present at. It has been hanging in one of our tents for a long time, as a reminder of past victories. 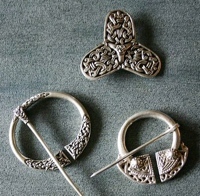 The crafting skills of the vikings held a very high standard and many of the techniques from then are still in use today. Elvegrimarne tries to reconstruct these techniques and we always have new upcoming projects in the pipe. We mend, improve and expand the group's equipment as well as our own personal gear with handmade clothes, forged tools, leather bags, waterskins and other useful things in everyday life. 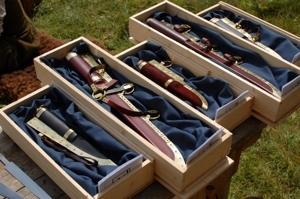 The inspiration, design and techniques we use are acquired from books, research, archaeological reports, and meetings with other viking reenactors. Every summer we aim for an even higher standard on camp gear, our clothes, weapons and the knowledge to make all of this from basic tools and materials available to the vikings. During recurrent evenings Elvegrimarne spend crafting we learn everything from making wooden chests, waterskins and weaving to plant coloring fabric and sewing with the same stitches and techniques used well over two thousand years ago. Pretty much all the gear Elvegrimarne brings to events and shows we have made ourselves. It should come as no surprise that handmade crafts play an integral role in looking the part as a reenactor. In fact many of the serious reenactors out there will have spent a considerable amount of time first researching, then making all of their gear by hand. While we do encourage you to get out there and research what to wear and how to make it (after all that is what reenactment is all about), we know by experience that getting started is the hard part. Unfortunately there is also an abundance of very inaccurate sources out there, especially on the internet. But fear not, what Elvegrimarne can do is offer you a good starting point through the material and research we have gathered through the years. For a small price you'll be able to get ample material for what we believe is as historically correct as you can get. That includes patterns for skirts, pants, headgear, shirts, robes and much more. Contact Susanna in Elvegrimarne for more information. Show everybody that you don't just talk the talk, but look the part too. From modern industrial design right into historic crafts, and you'll find it all over at Audhumbla. 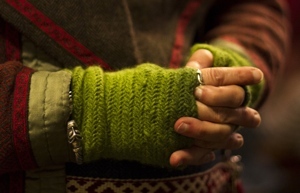 If crafting is your game, or you're just looking to get hooked up with some viking age bling to match your silk pantaloons, Edvin will be happy to help. On every reenactment event there is bound to be a kodak moment. Luckily elvegrimarne has a professional photographer - check her blog over at idunas. If you're lucky she'll let you model on her next artistic project. It's always good to know a smith, and Tomas has been the resident smith in elvegrimarne since the dawn of time. 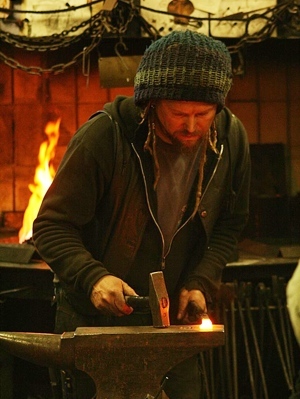 Whatever custom built, heavy duty, historical smithing project you have in mind - he is the goto guy. Head over to TC smithing immediately.